Borussia Dortmund's Ousmane Dembele was unplayable at times against TSG 1899 Hoffenheim. 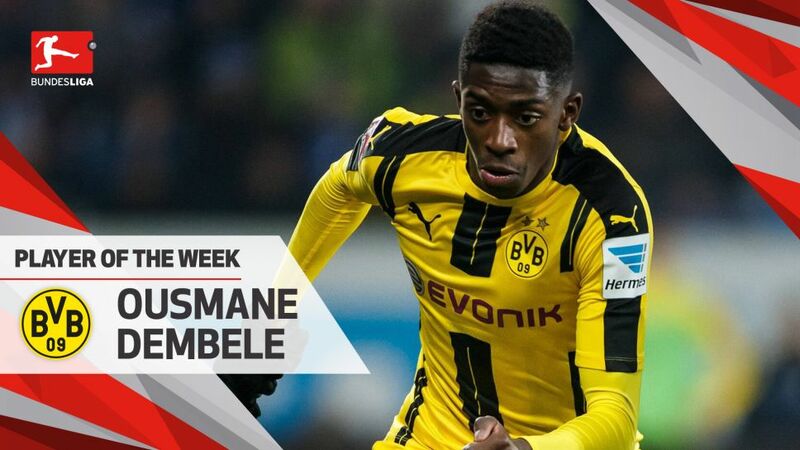 Ousmane Dembele was in irrepressible form in Borussia Dortmund’s gripping 2-2 draw with TSG 1899 Hoffenheim, setting up both goals and moving up through the gears when his side were reduced to ten men following Marco Reus’ sending off. Dembele earned 11 Official Fantasy Bundesliga points against Hoffenheim. Snap him up here! The 19-year-old used his lightning pace and superb control to torment Hoffenheim’s defence and could have had an even greater effect had it not been for an injury that forced him off for the last 21 minutes. Nevertheless, he still did enough to win your vote as BLMVP! Dembele now has seven assists for the season, second only to Leipzig's Emil Forsberg.He made 23 sprints in his time on the pitch on Matchday 15.The Hoffenheim goal was also in his sights - Dembele had two shots on target. Head to the Hoffenheim - Dortmund Match Centre for more.